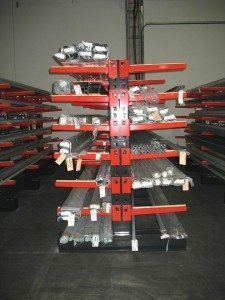 Unlike many organisations Blyweert Beaufort bucked the trend during most of the last recession and continued to grow their business on the back of being the major supplier of aluminium profiles for both domestic and commercial sectors. The expansion resulted in the necessity to embark upon better utilisation of their storage facility and improve upon selectivity of literally hundreds of different product lines and also increase the company’s efficiency with regards to stock rotation. The company recognised that the existing method of storing both raw materials and finished goods within stillages was inefficient and costly in terms of damages and therefore Stakapal’s light duty Cantilever Racking was an ideal solution to the problem. 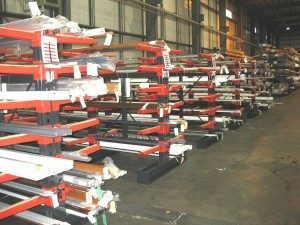 15 double sided runs of Stakapal’s light duty Cantilever Racking was installed within the two main operational area’s of the business. The runs consist of 5 columns no higher than two metres to ensure that all six arm levels per column side could be safely and easily loaded by Blyweert personnel. Noel Harris, Blyweerts, Operations Manager had previously purchased Stakapal product and always preferred the system due to its superior design in terms of strength and flexibility. The adjustability of the 600mm long Cantilever arms with a very simple, strong and effective wedge pin enables arm adjustment in literally seconds, unlike the more traditional bolted varieties of Cantilever Racking that not only take a considerable amount of time to adjust but also have additional inherit maintenance implications that you do not get with the Stakapal system.